- "New-To-You Table: donate items you no longer need or want, from photo books to jewelry boxes and more, and choose items from the table for whatever you wish to donate"
JVIA, a non-profit organization, owns and operates the Johnson Valley Community Center at the above address, located 1-3/4 miles south of Hwy. 247 (Old Woman Springs Rd.) on Larrea Rd. (paved), at the corner of Quailbush Rd. 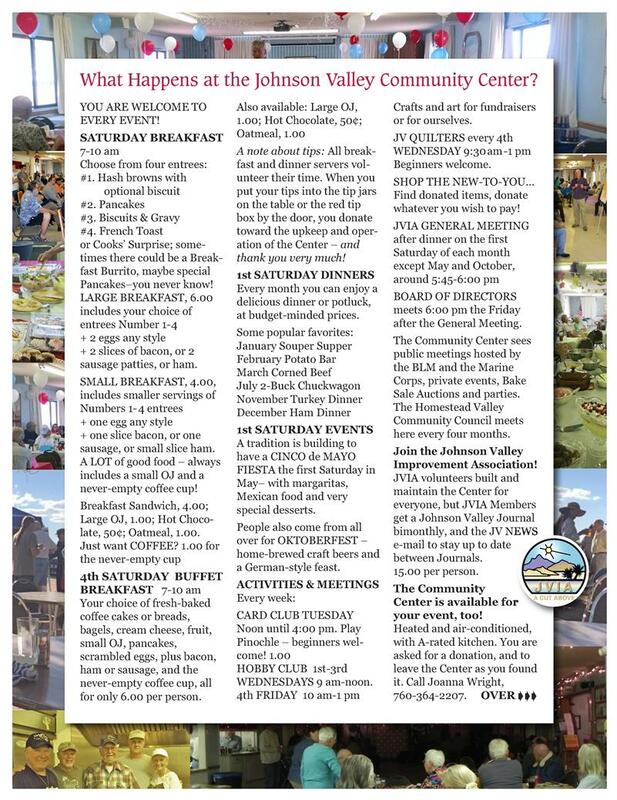 Everyone is welcome to every event and activity at the Community Center! JVIA is a 501(c)4 organization so your donations are not tax-deductible but much appreciated!